[size=0.8em]Note：vc represents cutting speed, f represents feeding rate, and ap represents cutting depth. Yu J. Machine tool condition monitoring based on an adaptive gaussian mixture model[J]. Journal of Manufacturing Science & Engineering, 2012, 134(3): 1013－1020. Xiao M H, He N, Li L. Studies on tool wear monitoring based on cutting force[J]. Materials Science Forum, 2011(697/698): 268－272. Rmili W, Ouahabi A, Serra R, et al. 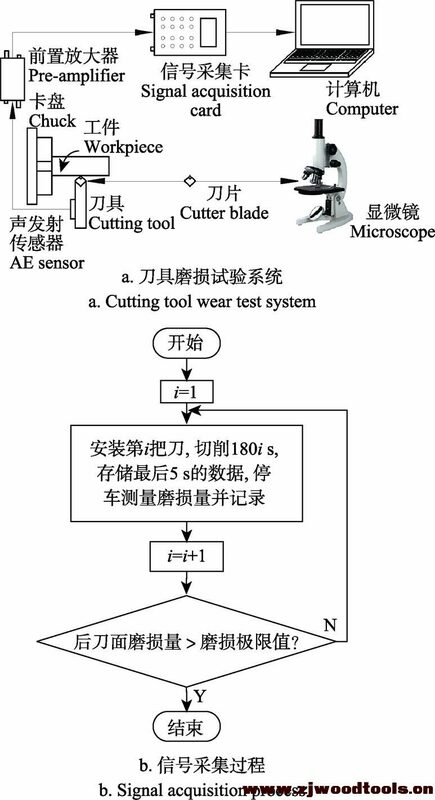 An automatic system based on vibratory analysis for cutting tool wear monitoring[J]. Measurement, 2016(77): 117－123. Li X. A brief review: Acoustic emission method for tool wear monitoring during turning[J]. International Journal of Machine Tools & Manufacture, 2002, 42(2): 157－165. Bolgorian M, Raei R. A multifractal detrended fluctuation analysis of trading behavior of individual and institutional traders in Tehran stock market[J]. Physica A: Statistical Mechanics & Its Applications, 2011, 390(21/22): 3815－3825. Lim J H, Khang E J, Lee T H, et al. Detrended fluctuation analysis and Kolmogorov–Sinai entropy of electroencephalogram signals[J]. Physics Letters A, 2013, 377(38): 2542－2545. Kantelhardt J W, Stephan A Zschiegner, Eva Koscielny- Bunde, et al. Multifractal detrended fluctuation analysis of nonstationary time series[J]. Physica A: Statistical Mechanics and its Applications, 2002, 316(1): 87－114. Siqueira G M, ênio F.F. Silva, Vidal-Vázquez E, et al. Multifractal and joint multifractal analysis of general soil properties and altitude along a transect[J]. Biosystems Engineering, 2018(168): 105－120. Suykens J A K, Vandewalle J. Least squares support vector machine classifiers[J]. Neural Processing Letters, 1999, 9(3): 293－300. Cerdà V, Cerdà J L, Idris A M. Optimization using the gradient and simplex methods[J]. Talanta, 2016, 148: 641－648. Raska P, Ulrych Z. Comparison of modified downhill simplex and differential evolution with other selected optimization methods used for discrete event simulation models[J]. Procedia Engineering, 2015, 100: 807－815. Jing Y, Fei H, Zhang K. Temperature compensation of maglev train gap sensor based on RBF neural network and LS-SVM combined model[J]. Transactions of China Electrotechnical Society, 2016, 31(15): 73－80. Dewandaru G, Masih R, Bacha O I, et al. Developing trading strategies based on fractal finance: An application of MF- DFA in the context of Islamic equities[J]. Physica A: Statistical Mechanics & Its Applications, 2015, 438: 223－235. Gulich D, Zunino L. A criterion for the determination of optimal scaling ranges in DFA and MF-DFA[J]. Physica A: Statistical Mechanics & Its Applications, 2014, 397(397): 17－30. Xiong Q, Zhang W H. Rolling bearing fault diagnosis method using MF-DFA and LSSVM based on PSO[J]. Journal of Vibration and Shork, 2015, 34(11): 188－193. Zhao X, Ba Q, Zhou L, et al. BP neural network recognition algorithm for scour monitoring of subsea pipelines based on active thermometry[J]. Optik - International Journal for Light and Electron Optics, 2014, 125(18): 5426－5431. Abstract: Cutting is an important process in machining. In order to improve the automatic and intelligent level of machining and improve the production efficiency and quality, it is urgent to monitor the tool wear state. The feature extraction of wear state is the key to the tool wear monitoring. In view of the unique advantages of multifractal theory in accurately depicting the nonlinear phenomena and processes of the system, a tool wear state recognition method based on multifractal detrended fluctuation analysis (MF-DFA) and least squares support vector machine (LS-SVM) is proposed. The acoustic emission (AE) signal is denoised with wavelet packet analysis, and the best tree of wavelet packet decomposition is determined and reconstruction is performed based on the minimum Shannon criterion so as to achieve the purpose of signal initial denoising. Firstly, the MF-DFA method is used to deal with the noise emission signals of the tool wear after denoising, and the long range correlation and fractal characteristics are discussed. 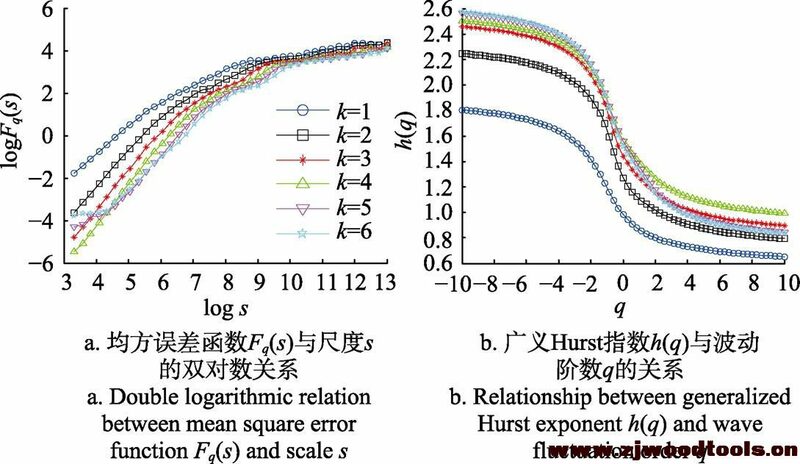 It shows that the tool wear time sequence is an orderly process with long range correlation, and the internal fluctuation is not random, and it has the ability to maintain the trend. 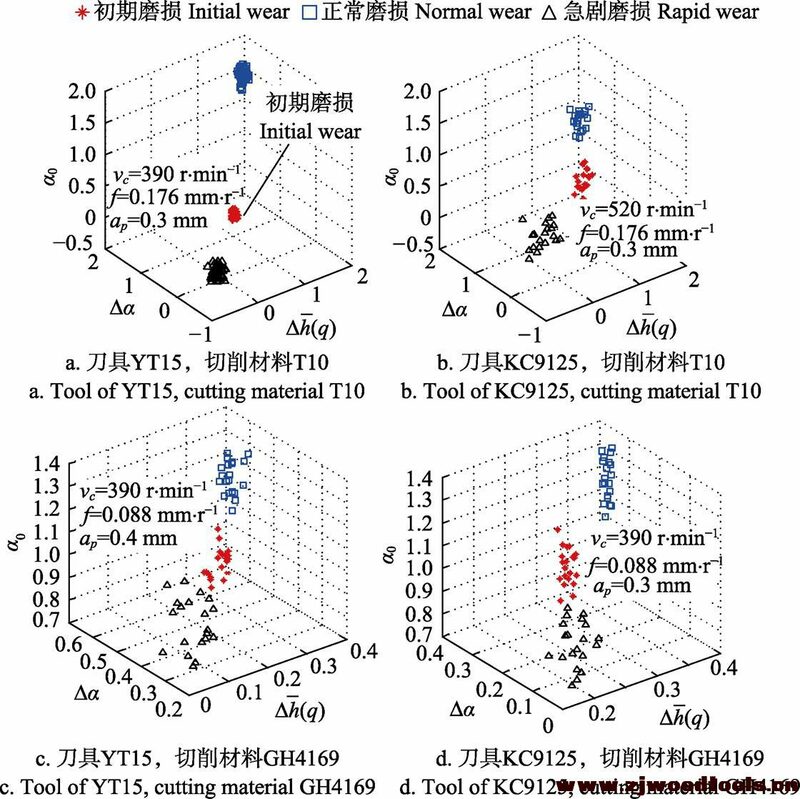 Then, the multifractal spectrum parameters of different wear stages were analyzed and compared. The parameters of singular exponent corresponding to the point of extreme value and multifractal spectrum widthare increasing with the progression of the wear stage, which indicates that the greater the wear amount, the greater the fluctuation of the AE signal, the more uneven the probability measurement of the whole fractal structure, the more random the fluctuation. The values of the AE signal multifractal dimensionunder different wear states are less than zero, and the multifractal spectrum is left hook like, indicating the number of the maximum subset in the probability measure is relatively large. The absolute value of the normal wear stage is the smallest, which indicates that the volatility is the smallest in this stage; the value of the parameter increases with the increase of the wear amount, indicating that the greater the fluctuation degree of generalized Hurst exponent, the stronger the multifractal characteristics. The singular exponent corresponding to the point of extreme value, the multifractal spectrum widthand the mean of the generalized Hurst exponent, which can sensitively characterize the tool wear state, were selected as the characteristic quantities, and the three-dimensional feature vectors were constructed to characterize the tool wear stage. The clustering effect of the extracted tool wear state characteristics was obvious. The LS-SVM algorithm, SVM algorithm and BP (back propagation) neural network are applied to recognize the tool wear state. Simplex iterative algorithm is used to optimize the parameters, the optimal model is constructed to determine the performance of each group of parameters, and the parameters of regularization and kernel function are determined. The average recognition accuracy is 97.78%. 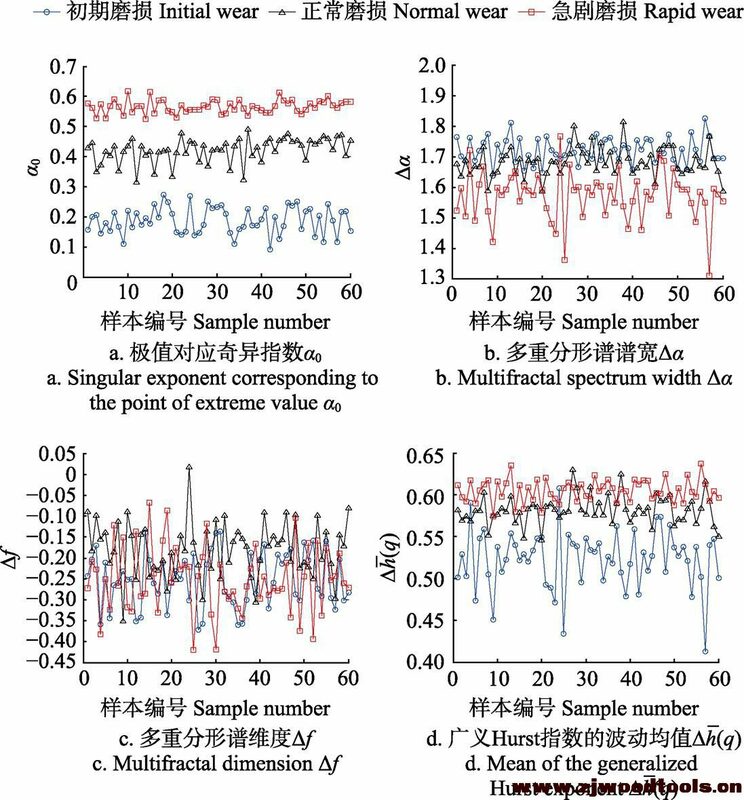 The results show that the tool wear AE signal has long range correlation and obvious multifractal characteristics, the multifractal parameters, i.e. 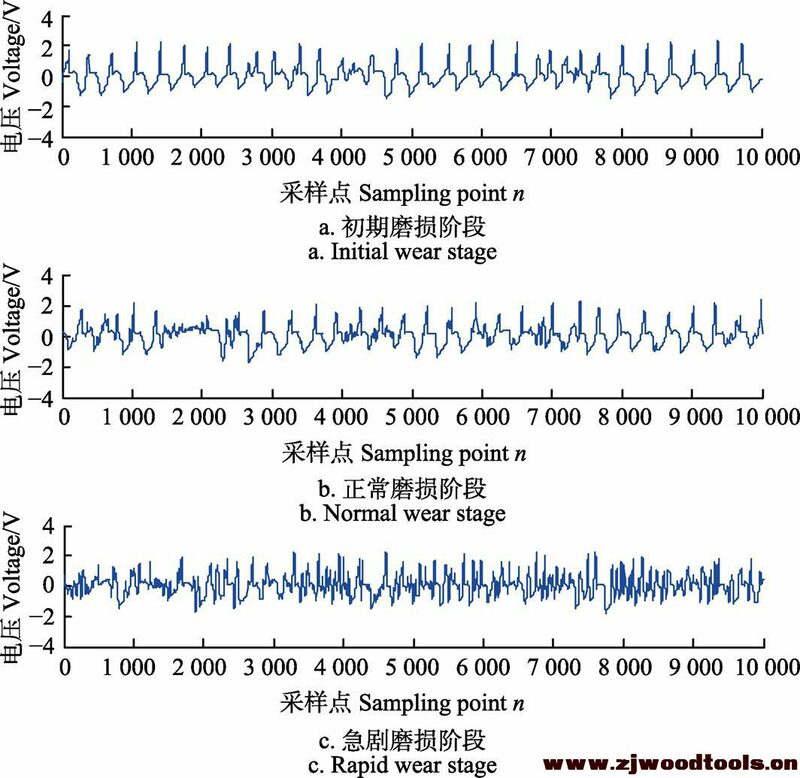 singular exponent corresponding to the point of extreme value,multifractal spectrum widthand mean of the generalized Hurst exponent can be used as sensitive characterization for the feature of tool wear stage, and the tool wear stages can be clearly distinguished. 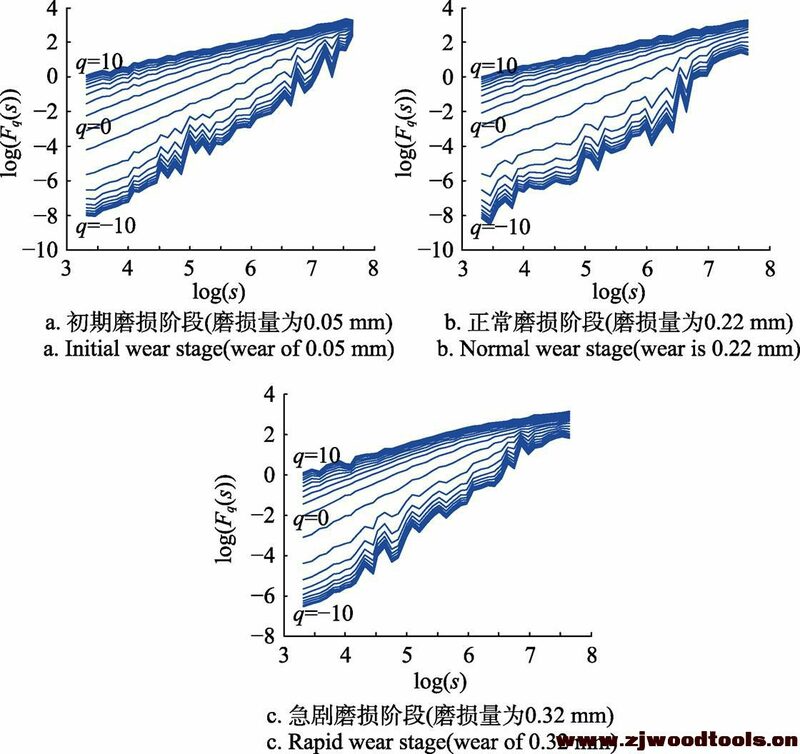 The multifractal spectrum features extracted with the method based on MF-DFA and LS-SVM can identify the different wear stages of the tool well, verify the effectiveness of the recognition method, improve the accuracy of recognition, and lay a foundation for the realization of the wear prediction.